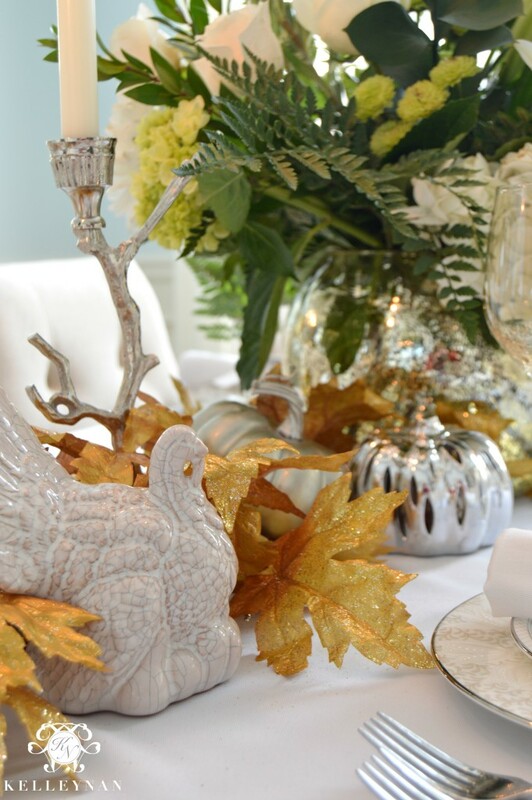 During the early onset of autumn, I posted a blog on how I created my fall tablescape. If you missed it, you can check it out here. 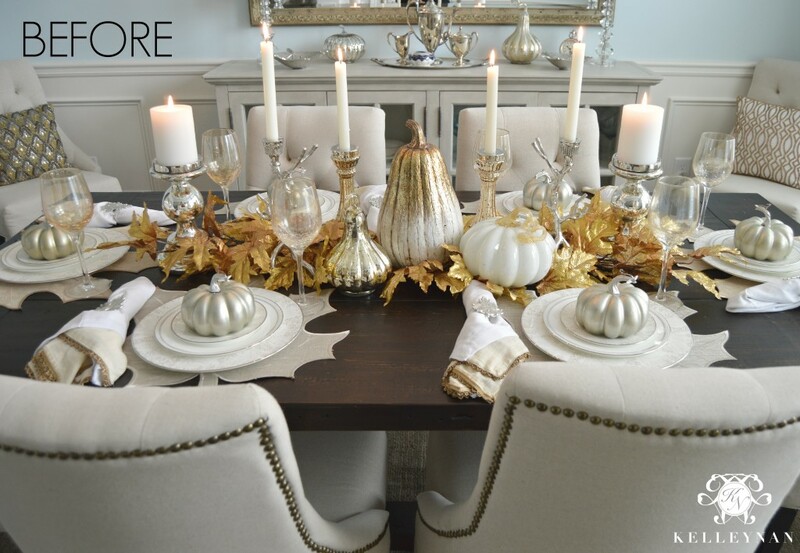 I love fall decor and I especially love that it sticks around for a few months. But, by the time Thanksgiving arrives, I’m ready to switch things up a bit. Since we were hosting Thanksgiving dinner at our home this year, I wanted to modify our table with the primary goals of 1. Not crowding the dinner guests; 2. Maintaining a sense elegance and drama; 3. Working with what I already had on hand. With a few changes, fresh blooms, and personal touches, I completely transformed the look of our table. This is how our table looked prior to the transformation. Since we were expecting to host 10 guests, the first order of business was to clear the table and put in the leaf extenders. To simplify, I also added a white tablecloth and removed the leaf place mats. I love place mats but they tend to make one feel confined in the area in which they are allowed to eat. Since a tablecloth doesn’t have defined boundaries, it makes the table a feel a bit less cluttered. It is also super easy to ball up along with the napkins, and send along for dry cleaning after the dinner is over. I took the layered napkins down to one usable napkin and rolled it neatly. 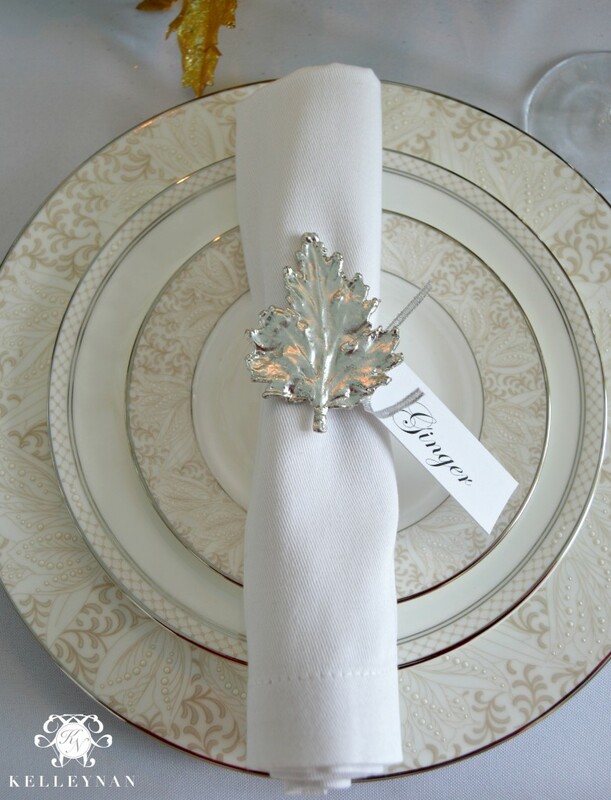 I finished it off with by tying a place card onto the napkin ring and removed the individual plate pumpkins. 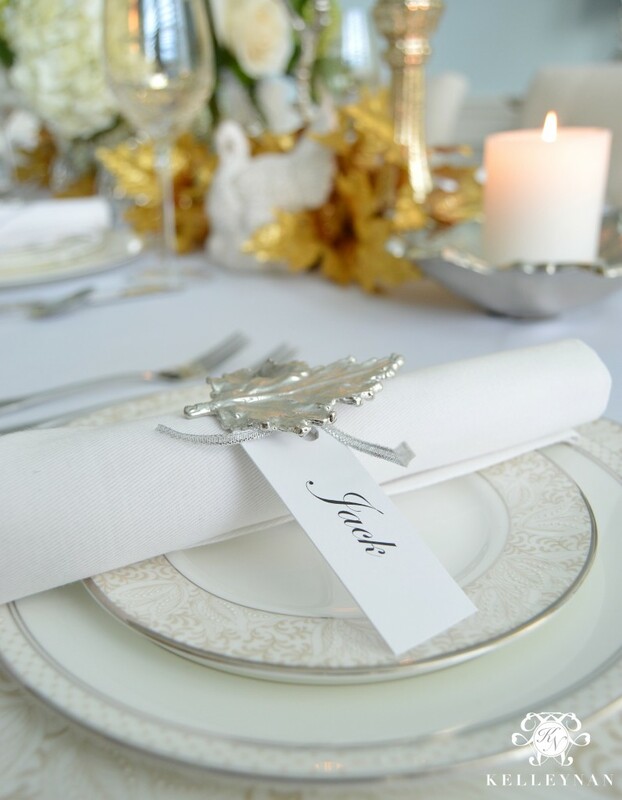 Since we did have 10 total guests, place cards were a must. For a quick solution, I printed the names on card stock, cut them to size, punched a hole, and tied them with a thin silver ribbon I had on hand. I kept all tapered candle holders and placed the larger pillars on silver leaves, previously on the buffet. I also used the same china and glasses as on the original table. I removed some of the larger pumpkins and incorporated some smaller varieties, including a couple I previously had on the individual plates. I also mixed in a couple of turkeys- I found these at HomeGoods for less than $5 each. I kept the fall leaves exactly as they were arranged previously and just adjusted them to nestle the pumpkins and turkeys. My favorite part of the table had to be the centerpiece. I picked up a couple of hydrangea stems, a bouquet of roses, and an assortment of white flowers from Costco and created five arrangements throughout the house. The primary arrangement was assembled in a large gold fishbowl and plopped right in the center. While not present for these photos, I did move chairs to the ends of the table. Since I have it set for six as my standard setup, we keep two spares set aside in the dining room. I used two chairs from my breakfast table to complete the seating. 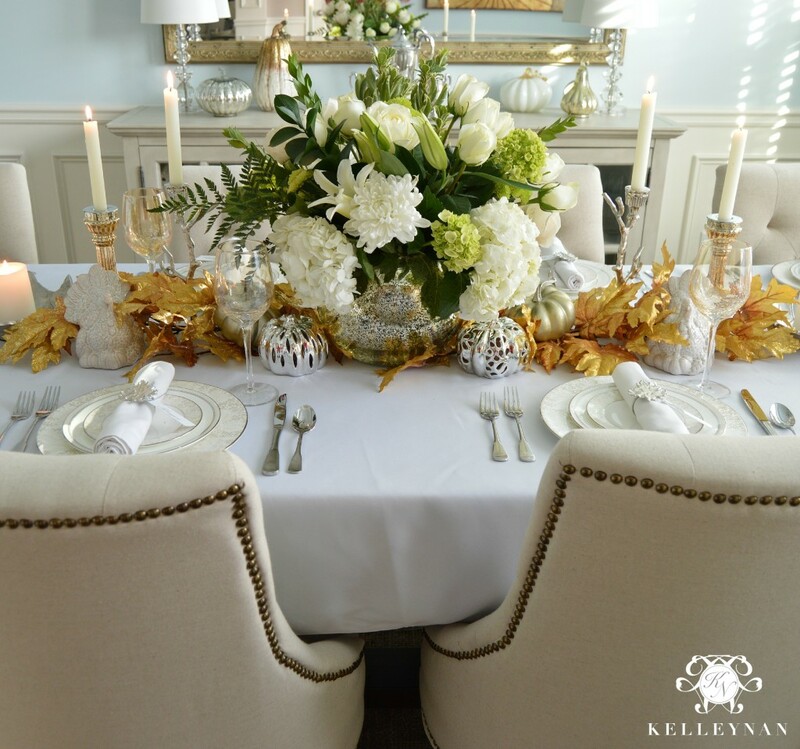 It is hard to believe the difference that adding a tablecloth and a flower arrangement can make, virtually the only big changes to Table 1 and Table 2. 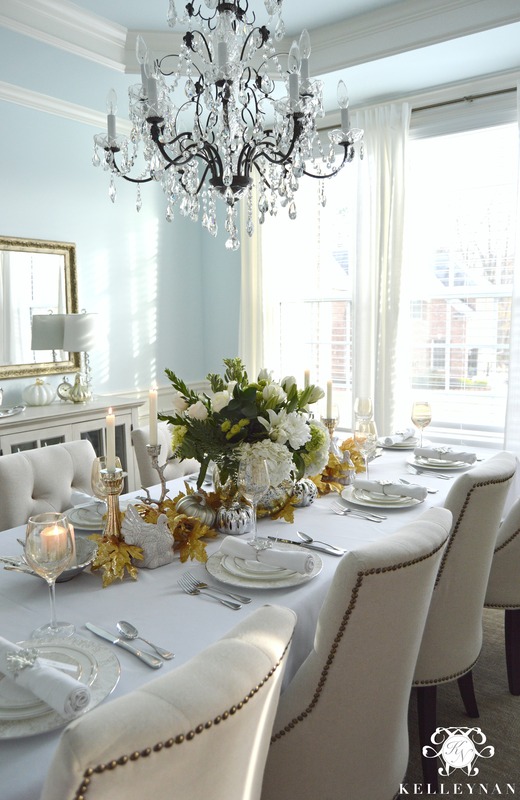 The white base completely brightens the room, making it feel more spacious and less crowded with 10 guests. I would love to hear from you in the comment section below! 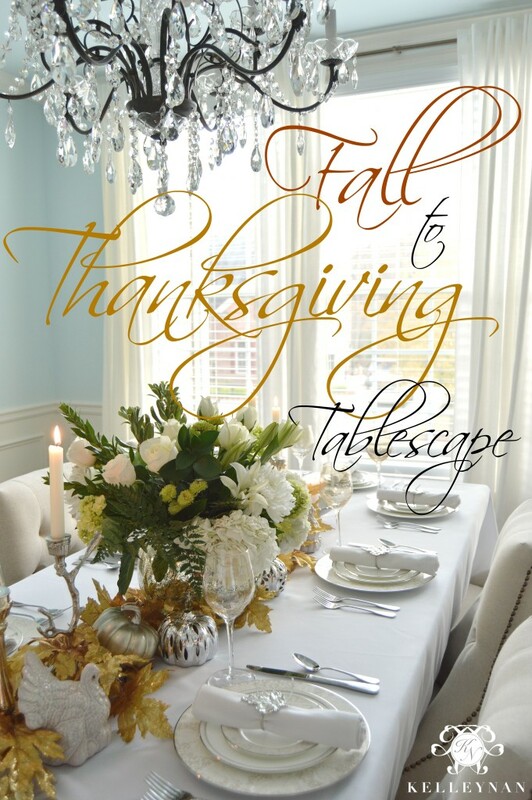 Did you like the fall table or the new Thanksgiving table? 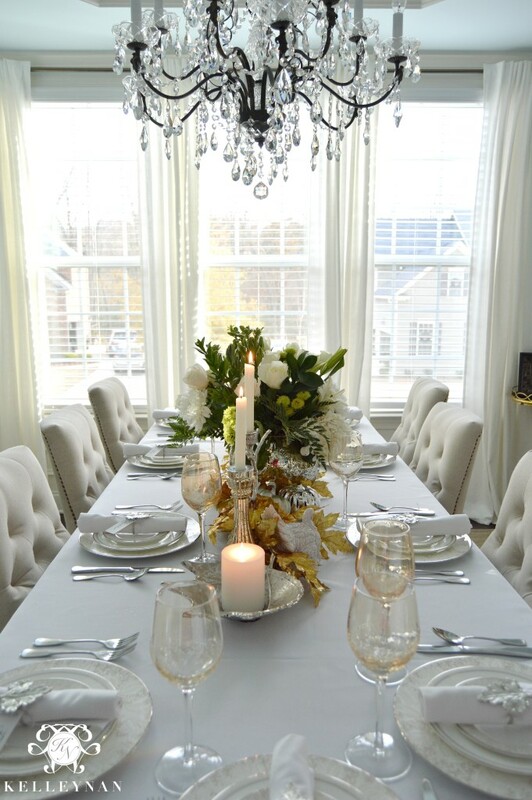 Do you have any tips, tricks, or “go-to’s” when preparing to host a dinner? 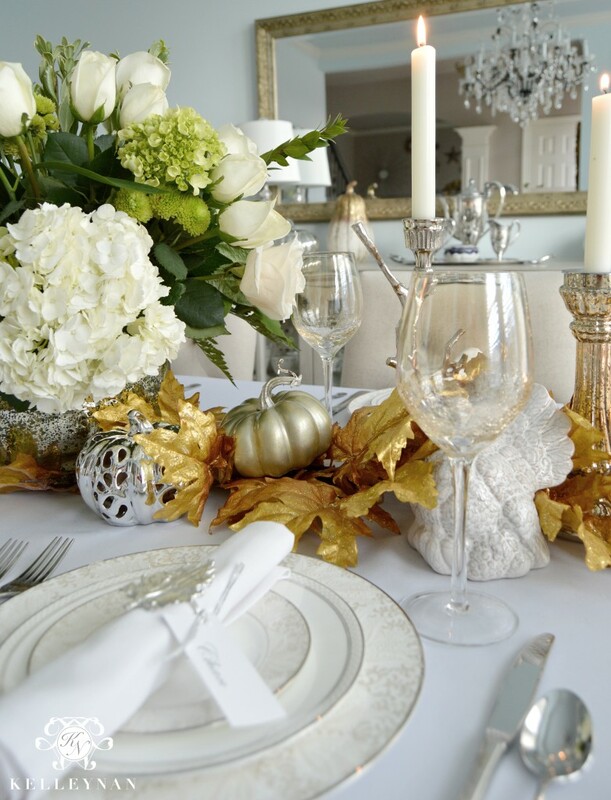 Stay tuned for details on my Christmas table, coming soon! 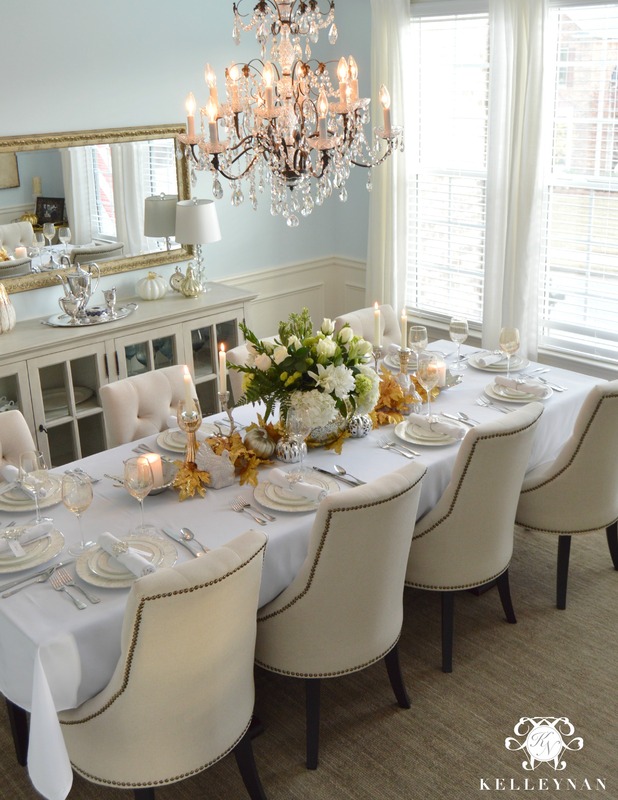 Thanksgiving at The Canterbury was fabulous! Can’t wait till the rotation comes back to you! I loved hosting with the help of the hostess with the mostest! Thank you! I don’t know if it was because it lasted for such a short time, but I think that was my favorite also. Kelley it looks so elegant and inviting! You did an amazing job! The flowers are my favorite part too. Stunning my friend!!! 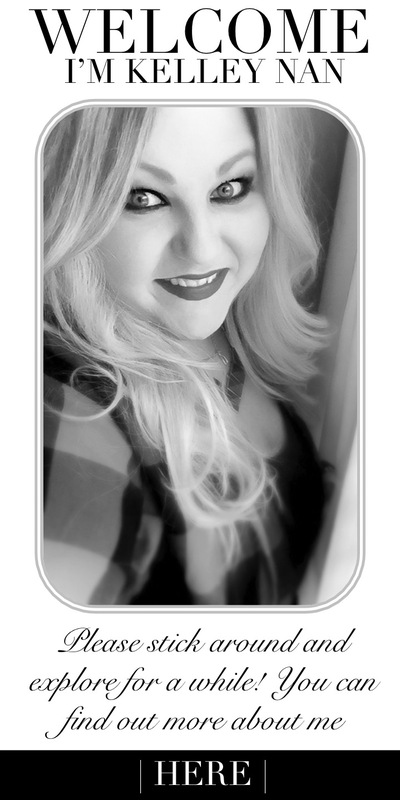 Randi, thank you so much! 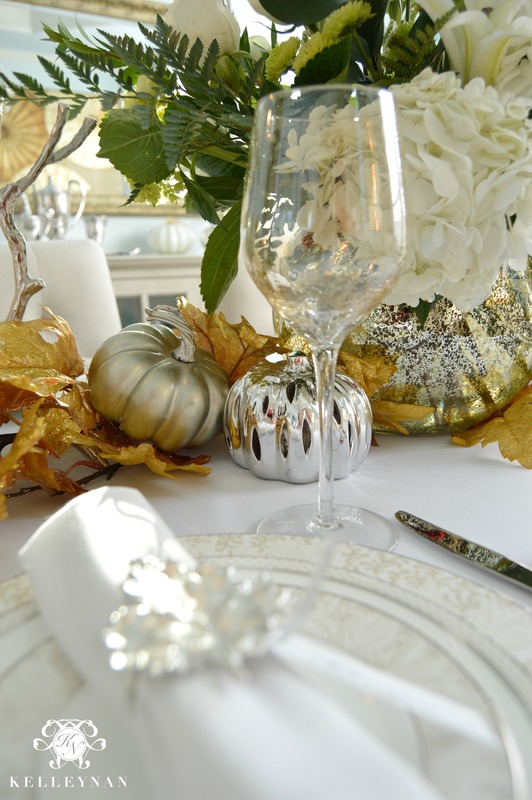 I so loved your fall tables- they were all rockin’! That is really a grand idea. Go for the impact first. 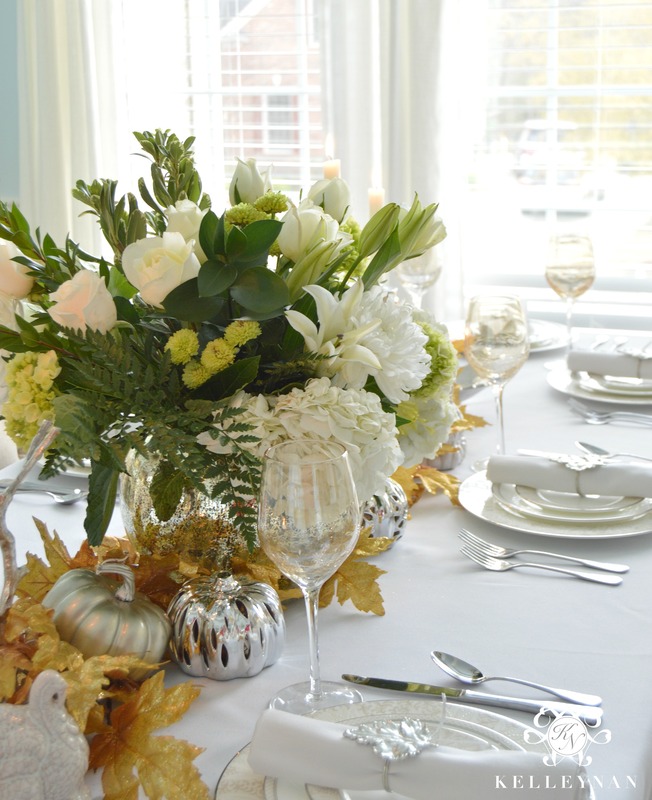 With two arrangements, the dining room would be delightfully graced with flowers! Who doesn’t love that?